I say the "art" of sliding because I don't understand all the physics that goes into it, but here's a look at getting more speed on slides both wet and dry. If you understand more of the physics, feel free to enlighten us. I've been bothering my superiors with these questions all morning. Last weekend, Greenbelt, MD held its annual Labor Day festival which was an interesting slice of small-town Americana in the midst of the sprawling DC suburbs. Still unable to resist the lure of the rides at the age of twenty-something, I acquired a wristband and rode. 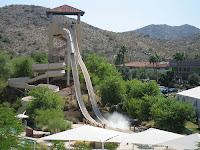 When some ten-year-old kid zipped past me on the Giant Slide, the manager at the bottom handing out the burlap bags advised me to lift myself onto my hands and heels, getting my rear off the bag. Lo and behold, it worked. Why? Beginning mechanics courses teach us that friction doesn't depend on surface area, so shrinking my points of contact shouldn't make me go any faster. However, they always note that this is just an approximation. The folks here with more advanced knowledge than I couldn't offer a detailed theoretical explanation, but if you can, please share! However, the change in contact area may be something of a red herring. Notice the image of the giant slide, particularly the brown spots where the slide has been worn down. Note also that these places are in the center, where my bum would slide, while the surface of the edges is still intact. The slide in Greenbelt was similarly worn, and I suspect that by lifting onto my hands and heels, I was keeping my weight off of the rough patches. Buzz Skyline offers an alternative theory. This is just a guess, but it may have something to do with the structure of the burlap. When you exert more pressure on a small area, the fibers probably deform more than they would if your weight is spread out. If you push gently on burlap, you can feel the prickly fibers sticking up. If you push hard, they bend over and the texture changes a little. In effect, it's like sliding on a different type of material depending on how much force you're exerting per square centimeter. Now let's rewind to when I was about ten, atop a water slide at Illinois' Magic Waters with my father. 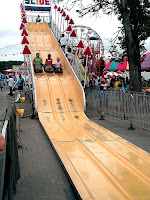 Like any good dad, he offered advice about the best way to ride the slide -- on my heels and shoulder blades. Here we are again, reducing surface area! But it works, as many a water slide enthusiast will attest. there were all these kids in front of me pulling down the back of their suits as they sat down on the slide, and i was like "what the fuh?". so, i asked one and he explained why. naturally, i tried it, and it's fast! So in the case of water slides, the important point of the heels-and-shoulder-blades tactic is that it keeps the bathing suit off the slide. That said, remember that testing this hypothesis in the US could result in arrest for indecent exposure. Water Slide -- Brian "playhockeyeh"
Simple, you're reducing your surface area which therefore is reducing the amount of friction being formed which makes you go faster.